Your first house will have a basic kitchen, but it does not come with any cooking utensils. Before you can start cooking you will need to buy some cooking utensils from the General Store in Garmon Mine District. The size of your house will determine how many cooking utensils you can have placed as active in the kitchen. The beginning level 1 house can have 3 utensils out in the kitchen, the level 2 house can have 4, and the level 3 house can fit all 7 utensils. You can place them in your kitchen by using the diary next to your bed. Besides the 7 utensils, there is a box of Matches (utensil #8) that does not require the use of a kitchen. The Matches are an item you can buy from Barbara's shop for 480 G. Lighting a bonfire allows you to roast fish and a few different kinds of vegetables. When you're done, do not forget to put out your bonfire with your watering can. Hamilton does not like it when people leave their fires unattended, and you will get a stern lecture the next morning if you do so. Cooking utensils will come in different styles such as Cute, Chic, Normal, and Gorgeous. The style of the utensil only affects its looks when it is set out in your kitchen. All of the utensils work exactly the same no matter what style they are. The Dyepot used to make colored yarns is also an item for your kitchen, but it is not used for "cooking" and can only combine yarns and flowers/herbs together. The ingredients you need for cooking recipes can be produced on your farm, found growing wild around Castanet, or purchased from the many shops available. All ingredients must be in your rucksack if you want to cook. There isn't a way to swap between your rucksack and any storage furniture (refrigerators, toolbox, etc.) you might be storing spare food in. To start cooking, walk up to the utensil in your kitchen and press the A button. 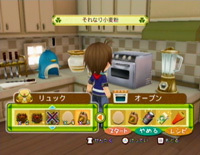 You will then get two sets of panels; the panel on the left displays the contents of your rucksack, and the panel on the right are the ingredients that will be cooked together in your chosen utensil. To select an ingredient, scroll through the rucksack panel and then select it (press A) to move one over. You can cook more than one of the same type of item in a single recipe. Recipes - This option will open your list of recipes so you can simply look at the cooking recipes you already know. Once you leave your recipe book, the list of ingredients you were looking at goes away. You will have to remember what the ingredients were, or go back to the Recipes menu and look at the recipe again if you forget. If all of your chosen ingredients combine to make a successful recipe, you'll receive the results in a few moments. If they don't combine together you will receive a Failed Dish instead. New recipes you discover will be automatically written into your list of recipes. You can also access your known recipes by looking at your Bookcase instead of directly through a selected cooking utensil. The Dyepot does not have a recipe list. The item does fit in your kitchen as a utensil (instead of inside the barn in Tree of Tranquility) but there isn't a list of recipes for it. The Dyepot is very simple to use; take 1 yarn (silk, flax, or wool) and 1 flower or herb (any kind), and the results will be a colored dyed yarn. The Dyepot only takes 2 ingredients and it will not accept ingredients that can not be combined to produce dyed yarn. When cooking, the quality of the item only matters for certain dishes that also have a quality associated. Most of the time you can use a Decent item or a Perfect item and end up with the same result. If a cooking recipe calls for an egg, any type of egg will do whether it's a chicken egg, a duck egg, or ostrich egg unless the recipe specifically calls for a certain type. The same is true for milk, butter, and mayonnaise. You can get recipes by making the cooked dish yourself, buying the recipe from shops or festivals, and watching Maya's Exciting Cooking show on your televisions on Mondays and Thursdays. The last place you can find recipes is in other villager's kitchens. Once a season or so you'll find a recipe in their houses if you walk inside and start pressing the A button over and over when you are standing next to the house's kitchen. If you don't find any more recipes then you've found all that were available from that villager's kitchen. 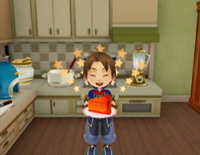 When you collect all 287 recipes you will be rewarded with the Cooking Trophy for your house. Most of your ingredients will be easy to figure out. Some ingredients require processing in the Horn Ranch windmill or the Flute Fields waterwheel before you can cook with them. The waterwheel on your own farm, when built by Dale, can handle both of these tasks. Other ingredients are the result of basic cooking recipes. Ingredients like butter, cheese, and mayonnaise are produced from the Maker Machines you can buy from the General Store. Wild grown items like herbs, berries, clams, seaweed, etc., can be picked up off the ground around Castanet.